2013 September 18 Steve Nguyen, Ph.D. There has been much talk about Apple and its struggle to continue to be innovative after Steve Jobs’ untimely death in October 2011. For instance, after the most recent Apple event introducing the newest iPhone models (iPhone 5S and 5C), analysts and pundits were unimpressed. “Underwhelmed” wrote CNN. In November 2010, I wrote a blog post titled, “The Dangers of Charismatic Leaders.” One of the points I made was that the dependence on a charismatic leader, like Steve Jobs, inhibited development of competent successors. Indeed, as Oracle’s CEO Larry Ellison said Jobs was a visionary and his creativity far exceeded his executives. Steve Jobs was a larger-than-life CEO at Apple. Setting aside his temper and authoritarian style of management, he had two qualities that will be very difficult for Apple to replicate: an uncanny ability to sense consumer demands (relying on his intuition, without doing any market research) and the ability to passionately and unequivocally sell his vision (and in the process reinvented entire industries). Yukl (2010) said charisma is temporary when it is dependent on a leader who is viewed as extraordinary. When that charismatic leader leaves or dies, it can create a succession crisis. Although the crisis in leadership succession did not occur at Apple, what seemed to have occurred is a crisis in creativity and innovation. There are three things charismatic leaders can do to leave their mark on the company. One approach is to transfer charisma to a successor. That certainly did not happen because the personalities of Steve Jobs (an extrovert) and Tim Cook (an introvert) are very different. A second approach is to develop a structure that will continue to carry out the leader’s vision. The problem is that the enthusiasm is sometimes greatly diminished when a charismatic leader is no longer around, thus reducing the effectiveness of the overall organization. The third approach to continue the leader’s vision is to “embed it in the culture of the organization by influencing followers to internalize it and empowering them to implement it” (Yukl, 2010, p. 271). Can Apple Still Innovate Without Jobs? NO: Hartmut Esslinger, a designer who began collaborating with Steve Jobs in 1982 “to carry Apple’s products to international prominence” says the Apple today is very different and not the innovative company he experienced during his time working with Jobs. Esslinger has a unique insight since he personally worked with Steve Jobs to create a “design language” that was used on the Macintosh line of computers for over a decade. According to Esslinger, a design language is “about forming a visual brand DNA that expresses a company’s true potential, as well as the founders’ unique values and (hopefully) visionary goals.” Esslinger believes that the Apple of today is more like the Sony of the 1980s — the visionary founder is replaced by leaders who do not think about innovating, only about refining the product line and increasing profits. YES, but: Salesforce’s CEO Marc Benioff, who interned at Apple in 1984 and was mentored by Steve Jobs, had some interesting things to say about Apple’s current state (see the YouTube video below). At the TechCrunch Disrupt 2013 conference, Benioff said Apple’s executives need to find themselves and be who they are, not try to imitate Steve Jobs. He said they should respect the past, but project the future. Marc Benioff’s advice aligns nicely with the third approach (that followers internalize the leader’s vision and be empowered to implement that vision). The challenge now for Apple (it’s been almost 2 years since Steve Jobs’ death) is how to retain their innovative DNA — keep Steve Jobs’ vision, but remain who they are without him. 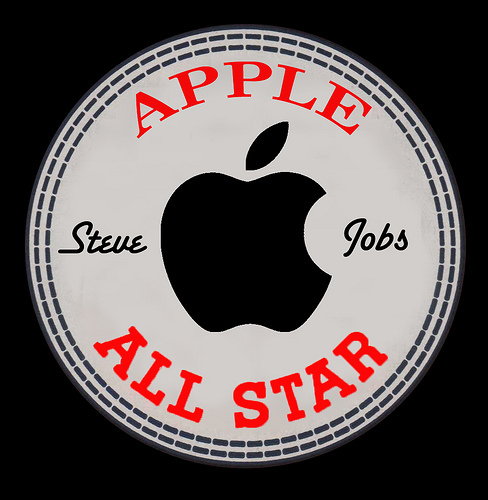 There’s no doubt that Jobs’ vision and creative genius far exceeded those of other executives at Apple. But one can argue that Apple still has enough talent and creativity on its leadership team to press onward. Yukl, G. (2010). Leadership in organizations (7th ed.). Upper Saddle River, NJ: Pearson/Prentice Hall.